The global mass spectrometry market, mainly driven by technological advancements, increased pharmaceutical research, growing concern for food safety, and increase in investments, funds, and grants by government bodies worldwide, was valued at $4017 million in 2013, and expected to reach $6096 million by 2018, at a CAGR of 8.7%. According to the World Health Organization, The global pharmaceuticals market is worth $300 billion a year, a figure that is expected to rise to $400 billion within three years. The 10 largest drugs companies in this sector have control over one-third of this market, several with the sales of more than $10 billion a year and profit margins of about 30%. Six are based in the United States and four in Europe. It is predicted that North and South America, Europe, and Japan will continue to account for a full 85% of the global pharmaceuticals market well into the 21st century. 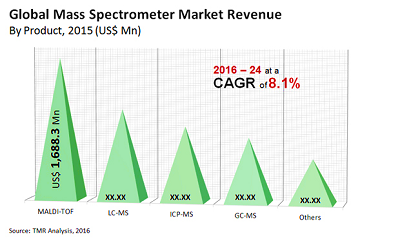 The global mass spectrometry market was valued at $4,948.3 million in 2015, and it is expected to grow at a CAGR of 8.1% during the period 2016 - 2022. The global market is increasing, due to increasing food safety concern, growing demand in life science and clinical analysis sector, and increasing healthcare expenditure and development of healthcare infrastructure. In addition, the technological advancements with the advent of Mass Spectrometry equipment are further encouraging the growth of the market.